The first implicit claim in the title is rather straightforward, so we’ll deal with it quickly: The Iraq misadventure helped the US realize that toppling a foreign government is the easy part; the subsequent occupation is costly, dangerous, and unlikely to be successful within the near-term. The scars left from Iraq bred the hesitancy with which the US now approaches Libya. Indeed, the US has had a fairly consistent attitude throughout this string of North African uprisings: Cautious support of Egypt’s democracy movement is now followed by reluctant leadership of armed intervention in Libya. The second claim deserves more explanation. I am arguing there is a causal link beyond just the obvious assertion that pro-democracy protests in Tunisia (and Egypt), inspired those in Libya. Rather, I would highlight two ways in which the events in Tunisia and Egypt shaped the actions of, on the one had Qaddafi, and on the other, Western governments, particularly France. Once again, the first assertion is more straightforward than the second. After seeing that former Tunisian President Ben Ali and former Egyptian President Mubarak were unable to appease protesters in their respective countries by promising reforms, reshaping their governments, or making other concessions, Qaddafi clearly came to the conclusion that the only way to deal with an uprising in his country, should it occur, was brute force on a scale not seen in Egypt or Tunisia. This explains why he was so quick to turn the guns on his people, and why, unlike Mubarak who at first called his detractors “honest young people and citizens” and seemed to acknowledge that they had legitimate grievances, Qaddafi quickly called those protesting against him “enemies” and vowed to crush them. 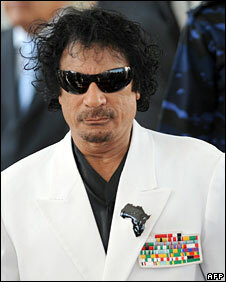 But if Qaddafi learned from others’ mistakes, the West quickly learned from its own. Because little Tunisia didn’t attract much attention from the Western media, there was little pressure on Western governments to take a stance, and most remained silent, until President Ben Ali left the country, at which point Western leaders praised the Tunisian people. But while other Western governments were indifferent to the Tunisians’ struggle, France offered the assistance of its security forces to President Ben Ali just before he was forced out. Tunisia was a real banana skin for the West, and many rightly worried that they had come down on the wrong side of history. Enter Libya. Unlike Messrs. Mubarak and Ben Ali who were considered friends and allies by the West, Qaddafi had a history as a pariah (his opening up to the West in 2003 notwithstanding). Military intervention from the West had already been requested by the Libyan rebels, and France especially must have sensed a chance to right its wrongs in North Africa. And now back to the title of this post: The roles from the pre-Iraq war drama have been reversed. Then the role of the overzealous crusader was played by the US, with France acting as the obstinate peacenik. This time round it is France who has willingly donned the crusaders mantle (and title) in pushing the UN Security Council to authorize military strikes against Libya. The US, meanwhile, is doing everything it can to be rid of responsibility for this military adventure. The reason for France’s enthusiasm in leading the charge against Libya (and indeed firing the first shots) is simple: French leaders want to be on the right side of history. They believe that when historians look back, they will view the series of uprisings across North Africa as part of the same event: The Arab Spring of 2011. France performed poorly in the first act in Tunisia. But if they take the lead in ridding Libya of Qaddafi, perhaps history will indeed view them as being on the side of right. My blogging career is but a few weeks old and already I’ve been afforded an opportunity to strut and preen. The occasion is my prescience two weeks ago in writing that oil-rich autocratic regimes (and China) ought to be more frightened by events in Bahrain than Egypt. Saudi Arabia took note yesterday and sent 1,000 troops to Bahrain (their neighbour via a 25km causeway) to help prop up Bahrain’s ruling Khalifa royal family. This was at the request of the Bahraini government, so it was ostensibly their idea, but there is absolutely no doubt that the House of Saud’s intention is to demonstrate to their citizens that they do not want Bahrain’s story to be replayed in Saudi Arabia. month now, since a “Day of Rage” was called for in Pearl Square in the capital, Manama. So far, the Saudi kingdom has not seen a need to get explicitly involved in the Bahraini situation (although domestically, King Abdullah has thrown $36 billion at his people to stave off any unrest). BUT last week, from my observance, there seemed to be a turning point. The Pearl Square protesters went from demanding things of the king (e.g. ending discrimination against Shi’ites in housing and government jobs, dissolving the cabinet, etc.) to demanding that the king himself leave. The Saudis next door probably felt that, if the first sort of protest were mimicked in Saudi Arabia, they could handle it. But demanding the removal of a monarch was a step too far, and thus the intervention. The Saudis are right to worry about “contagion.” Some might suggest that Bahrain is Saudi Arabia in miniature. I would still maintain that Bahrain is Saudi Arabia (and Kuwait and UAE and Iran, etc.) in the future: Bahrain is already starting to run out of the oil and natural gas that made the Khalifa family rich, and will probably be the first Gulf state to run out of oil reserves. With all this said, I really don’t think that Saudi Arabia’s intervention in Bahrain will spark a regional conflict that will draw in Iran, as some are suggesting. There are plenty of reasons why this is the case, but that’s all I ‘ll say for now. Final thought: What a rough year for Wiz Khalifa. First the Steelers lost the Super Bowl, and now his fam got haterz. Why China should be more concerned about Bahrain than Egypt. If you were like me two weeks ago, you might have been listening and/or watching Al-Jazeera English at work as disgruntled Facebook users thronged the streets of Egypt demanding the resignation of Hosni Mubarak who, until his ouster, challenged Italy’s Silvio Berlusconi for title of Most Goonish-looking World Leader. Anyway, as I watched the events unfold, I kept hearing the commentators and expert guests say that Egypt is a pivot point in the region and that “As Egypt goes, so goes the Middle East.” Although the wave of protests that swept Egypt (and which, lest we forget, began in Tunisia) has indeed spread across the Arab world, in some ways the tale of Mubarak’s fall is just a classic tale of a poor, oppressed citizenry rising up and overthrowing their rich, oppressive ruler. It’s a Marxist class struggle for the social networking age! And while the ability of the youth in Egypt to topple a decades-old regime should put entrenched autocrats everywhere on notice, I think the more revolutionary event that presages the world ahead is the uprising in Bahrain. In case you tuned back out of this part of the world as soon as the drama in Egypt ended, here’s a synopsis: Bahrain is an island nation in the Persian Gulf that has been ruled by the last 200 years by the Khalifa family. The Khalifa dynasty is Sunni, while the majority of the country is Shi’ite. Protestors in Bahrain, no doubt inspired by the uprisings in Tunisia and Egypt have taken to the streets, demanding among other things, more democracy and an end to government discrimation against the Shia majority. Although Bahrain is a kingdom, it does have a parliament, and something resembling a free press. The government has said it will open talks with all elements of society to address their grievances. Another thing Bahrain has is oil, and perhaps more importantly, lots of oil refineries. This means that, much like in the UAE and Qatar, Bahrain’s economic figures look more like something you might see in Eastern or Central Europe than the Middle East. Indeed, while Tunisia’s GDP per capita at Purchasing Power Parity was only $8,600 and Egypt’s all of $5,900, Bahrain’s is $24,000. The Human Development Index, a measure of well-being that takes into account standards of living, life expectancy and a host of other indicators, puts Bahrain in the highest category (Developed countries), at 39th, just ahead of Portugal. The arrangement in Bahrain is similar to that in other gulf statelets like Kuwait, Qatar, etc: the government spends some of its massive oil wealth on social welfare programs and direct cash payments to keep the people generally quiescent. In some ways, Bahrain might be a preview of the UAE and Qatar in a few decades; Bahrain is likely to be the first Gulf state to exhaust its oil reserves. SO, what does any of this have to do with China? We know the Chinese government was concerned enough about the example the Egyptian masses were setting that historic events got very little coverage in state media, and in fact, the search term “Egypt” was blocked on Sina, China’s equivalent of Twitter. But really, Egypt isn’t much like China: while Egypt stagnated under Mubarak, China’s economy has taken off, surpassing Japan to become the 2nd largest in the world, and in all likelihood, it will pass the US in a decade or so. Moreover, Egypt has a much younger and more restless population than China. In Egypt the median age is 24; in China it’s 33. So China doesn’t really have the same ingredients that led to revolution in Egypt. And while China probably isn’t that much like Bahrain either, the Chinese Communist Party has made essentially the same bargain with its citizens that the Gulf sheikdoms have: Prosperity in exchange for freedoms. Of course, massive oil wealth has made it easier for the Gulf states to maintain their end of this bargain, just doling out the revenues; while China has had to work significantly harder, constructing the a large and incredibly efficient industrial export machine. But the example of Bahrain shows that people won’t accept this trade off forever. Of course, there are unique factors in Bahrain that don’t necessarily apply to China: sectarian grievances; reliance on a larger neighbor (Saudi Arabia) for money and defence; and perhaps most uniquely, smallness: Bahrain is an island with a population 1/1000th the size of China’s. But nevertheless, Bahrain might be the wealthiest country to have people take to the streets to overthrow a government (unless one counts Tea Partiers in the US). All the more reason for China to question its model of social and political development. And perhaps in the meantime to block searches of “Bahrain” on Baidu.